This post is sponsored by Oikos Blue but the content and opinions expressed here are my own. I want to have that rewarding indulgence at the end of a hard day or week, to complement the good eating choices I’ve made throughout the day. 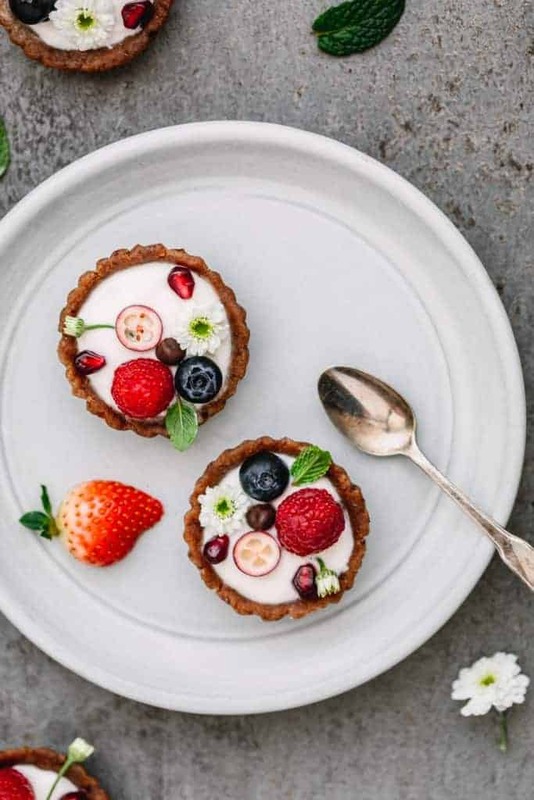 It’s fun to take a classic dessert and swap out ingredients with other options, make some tweaks here and there and see how it all turns out: No-Baked Yogurt Tart! Sometimes the dessert takes on a whole new taste with new flavors that shine and transform the dessert into something newof its own. That’s how I feel about this No-Baked Yogurt Tart dessert. The taste will blow away even the most steadfast dessert taste testers, which I see as the true test-test for a unique dessert recipe. This dessert is great for our Friday family night routine that usually consists of a movie and board games. We let the kids stay up later, turn the cell phones off and just enjoy each other’s company as a family. A delicious meal is a must, and I strive to make that a home cooked meal (though sometimes turn to take-in if in a time crunch). My kids like to help out in the kitchen, so getting them to pitch in a hand makes it a more fun experience and adds to the whole family vibe of the night. It’s our time together to self-indulge on the things we love, and dessert falls right in-line with that. This dessert is so easy to make that they took the lead on most of the steps, giving them a good sense of accomplishment. 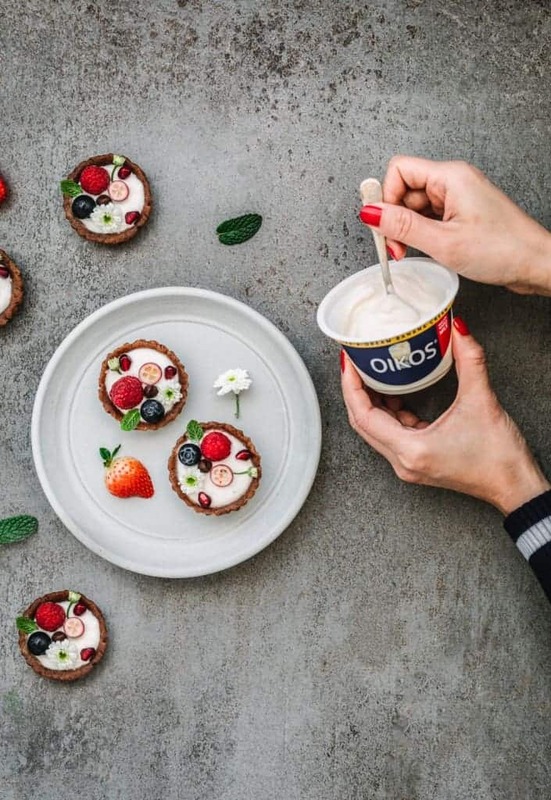 One additional reason that I really like this dessert (and two others I’ve made from Oikos® Whole Milk Greek Yogurt) is that they nail the category of rich and creamy desserts. Similar to a mousse that I made using Oikos the end result is mouth-watering treat that contrasts and complements other desserts that are crispy and crunchy (like the crust of this dish). My taste buds feel pampered when those two come together nicely. Oikos has 15 flavor varieties so it’s easy to mix it up on the fly without much effort. Place almond flour, salt, medjool dates, coconut oil, and water into food processor and blend until well combined. Shape about 1 tablespoon of dough into a ball and press into a cup shape in 12 oiled muffin cups, pushing dough up to the sides. Repeat this process. Cover the Nonstick 12-Cup Mini Tart Pan with plastic wrap and chill in the freezer for at least 10 minutes. 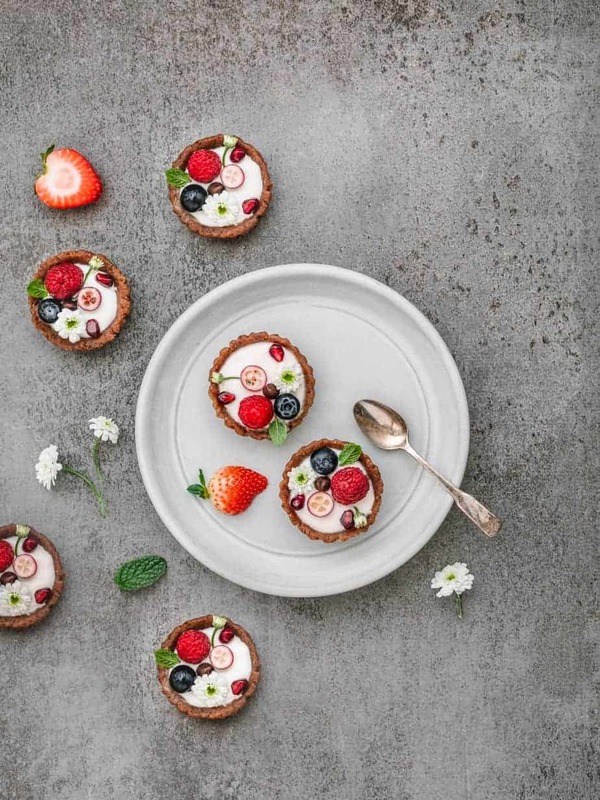 Fill each tart with Oikos® Whole Milk Greek Yogurt and garnish with mixed berries and mint. Serve and enjoy! Oh my goodness this sounds so good! Amazing all the different things you can do with yogurt – I love that it is no bake as well. This tart is so pretty! And delicious, I’m sure. I love yogurt, so I’m sure I’ll love this too. I was intrigued to see how you made a tart shell without baking! Yummy! I bet it still has a good amount of crunch. My son-in-law loves this brand of yogurt the most. This looks amazing! I’m for sure going to have to try it. What a great idea and a perfect way to mix up yogurt. this is not only STUNNING to look at but seems so easy to make- adding it to my list for easter! YUM! These are so pretty! They look delicious and easy to make too. What are the flowers? I absolutely love creating tarts. They’re beautiful to look at and delicious. Yours sounds like something I could create when I’m in a hurry and boy do they look and sound delicious. These are so pretty! They remind me of a similar tart I loved at Boma, the Animal Kingdom Lodge restaurant!!! YUM!!! This is one of the delicious and beautiful dessert that too no bake. I that you made a colorful beautiful dessert with simple ingredients. This is the spring in the plate. This dessert looks like heaven! It’s a must try! Those desserts are almost too pretty to eat. I think I’m just going to stare at them and drool. 🙂 Can’t wait to make them. It just looks amazing! Love how great yours look! I can’t wait to try it! 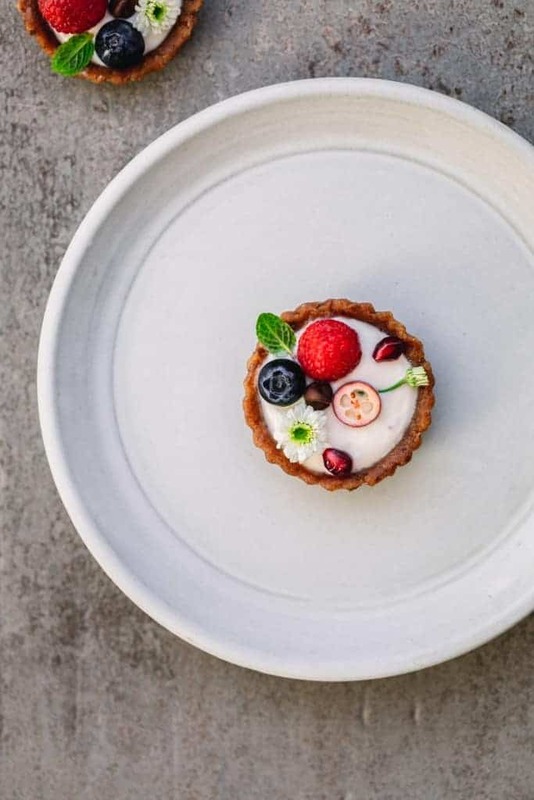 What a beautiful tart, and I love what you chose for the fruits! This sounds so refreshing and delicious. Great way to use fruit from when we go fruit-picking this summer as well. These are so gorgeous! Makes such a delicious and easy breakfast or snack recipe that’s a real crowd pleaser for parties or get togethers!